How much do you know about driving with transmission issues? Our staff here at Key Transmission and Gears in Englewood, Colorado have put together a bit of information for you. How do you know that something might be wrong with your transmission? Is it safe to keep driving your car if you feel the automatic transmission slipping? 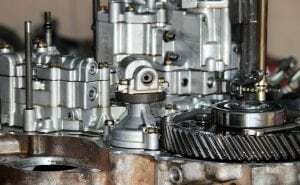 Let’s take a look at a few signs that your transmission is not in great shape and what could be happening with this crucial component. When an automatic transmission changes gears, you can usually hear a noise or change in pitch. If you start hearing that noise when your transmission shouldn’t be changing gears, such as driving on a flat road at a steady speed, that’s an indication that you’re driving with transmission issues. While it is normal to hear a change in pitch when an automatic transmission switches gears, clunking or thudding is not. Also, notice if you feel unusual or more pronounced vibrations. These are indications that the gears are not changing smoothly. You also may find that the vehicle doesn’t accelerate well due to difficulty with the gear changes. These should be fluid, and the vehicle shouldn’t jerk or shake. When you shift from park to drive, a car should respond and begin moving right away. If you experience a significant delay, that’s an indication your transmission isn’t functioning correctly. Your engine may rev up and sound like it’s doing something, but your car won’t go anywhere for a time. This is unacceptable. The first thing to do if you notice that the transmission is slipping is to check your transmission fluid. Put the vehicle in park and leave it idling while checking the fluid level. The transmission has a dipstick to see the fluid level. If you find that it is low, give us a call immediately to service the transmission fluid. Sometimes the fluid level is just low. But sometimes there is a reason, such as a leak. You can often tell if you have a leak by simply checking your garage floor. Transmission fluid is red, and a significant leak will leave marks under where your car is usually parked. If you notice these spots and transmission slipping symptoms, you can be very sure there is a leak. In that case, have an expert take a look. So, should you continue driving with any of these transmission issues? It’s not recommended. If it’s bad enough, your vehicle could be quite unsafe. You don’t want your vehicle unexpectedly changing gears at random moments. It’s dangerous and could end up causing extensive damage to your engine. Be sure to have your transmission checked out by the experts. 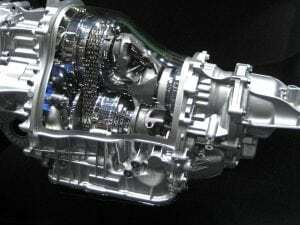 We here at Key Transmission and Gears have over 20 years of experience working on transmissions. We have the knowledge necessary to get you safely back on the road again. Give us a call today and don’t risk driving with transmission issues. To help our customers understand the differences Key Transmission and Gears in Englewood offers this helpful guide, Comparing Front and Rear Wheel Drive, AWD & 4WD, Part 1. There are a number of things the average driver probably doesn’t know, so for this 2-part series, we start with an explanation of how each of the drive types functions. We hope this will be helpful in choosing the right drive type for your needs the next time you buy a new car. Before we begin discussing the drive types, it will be helpful for you to understand the function of a car part called the differential. Think about two wheels on an axle. Every time those two wheels are not going in a straight line, one must travel a longer distance than the other. Thus the one that has to go farther has to rotate faster than the other. That is where the differential comes into play. It is a device with gears that allows for one wheel to go quicker than the other and keep the car moving evenly. 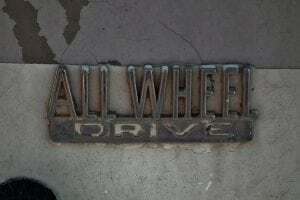 Rear wheel drive has been the drive type of choice for many years. This kind of drive is simple, easy to manufacture and provides a robust and reliable function. The setup is comprised of an engine in the front of the car with the transmission and a drive shaft transferring power to the rear wheel axle and thus the rear wheels. Though the power comes from the back, the front wheels handle the steering, effectively dividing the labor. The advantages of rear wheel drive are, it is strong and durable, and therefore this drive type is used in almost all trucks (with the exception of some light-duty models) and also luxury and racing car models. As a car accelerates, weight transfers to the rear wheels as a natural byproduct of acceleration. Driving from the heavier-weighted rear wheels offers better and faster acceleration. Hence, all true sports cars and racing models come with rear wheel drive. Front wheel drive, logically enough, keeps everything at the front of the car. The engine, transmission, drive gears, and differential are all there together at the front of the car. This type is popular in modern sedans in the middle to lower price ranges for two fundamental reasons, fuel economy and space efficiency. Front wheel drive cars can be made lighter and afford more room inside the car without the addition of the drive shaft and other parts needed for rear wheel drive. All minivans are front wheel drive for this reason. Though front wheel drive can never compete with the performance capabilities of rear wheel drive, it does do a better job in slippery conditions, making it a popular choice for drivers that live in snowy areas like Colorado. From all of us here at Key Transmission and Gears, we hope this guide, Comparing Front and Rear Wheel Drive, AWD & 4WD, Part 1, has helped you understand some key differences. Watch for our next article to find out the advantages and disadvantages of AWD and 4WD. And as always feel free to bring your car to our experts here in Englewood if you need help with any drive type. Key Transmission & Gears is a family owned and operated business that has been helping the people of Denver, Colorado and the surrounding metro areas to replace a transmission in Denver for many years now. We are a transmission repair business that specializes in transmission replacement, repair, and rebuild at the hands of our ASE certified auto technicians. If you are experiencing any type or form of transmission malfunction, it is best to seek the help of our professionals immediately as transmission replacement in Denver can be costly and unsafe while you’re on the road. Some tell-tale signs that you may be experiencing a transmission issue are unusual sounds, grinding, shaking or vibrating of your vehicle while driving at high speeds or differences in pressure when dealing with your clutch or switching between gears. If you’re unsure if you need to have your transmission replaced in Denver, feel free to stop in Monday through Friday, contact an ASE certified auto technician via our website at Key Transmission & Gears by leaving a private, personalized message, or simply by dialing (303) 806-8200. Transmission replacement in Denver should be cost-effective, swift and get you back on the road in a timely and safely manner. Get in touch with our staff today! As a vehicle owner, it is a good idea to have at least an idea about the basics of vehicle repair troubleshooting for transmissions. Helping you with your preliminary diagnoses, determine whether or not you should bring your vehicle into a certified facility like Key Transmission and Gears to have it checked. Of course, if you are still in doubt it is a much better idea to bring it in and have it checked by professionals just in case there is a serious problem with your transmission that you are not aware of initially. A little bit of prevention can end up saving you a big chunk of money if there is something not going quite right inside your vehicle’s transmission. Another benefit of understanding the basics is that you have an idea if your technician knows what they are talking about because you know what the right steps are to diagnose a transmission, and you can see that the technician is following them. So let’s take a look at the basics of vehicle repair troubleshooting for transmissions. Let’s say that you begin to notice a new noise in your engine, and you decide that you should take it in to have it checked out. The first thing the technician should do, obviously, listen to the motor and analyze the noise. If your technician is sufficiently knowledgeable, then they may be able to make a fairly accurate diagnosis from just hearing the noise. However, if the technician doesn’t know what might be causing the noise right off the bat, then the next step is to open the manufacturer’s service engine program and check out listings for “noise” under your vehicle’s specific model number and year. If there is a technical service bulletin or service news article out about this type of problem being common in that particular car, then you can be reasonably sure that the article details what is wrong with your vehicle and performing whatever fixes recommended in the article is all the help your car needs. If, however, the technician cannot find any service information to work with then it is time for him to break out the stethoscope and put on his white coat as he steps into his new role as the amazing vehicle “doctor.” Using the stethoscope, a technician can easily listen to each part of the motor effectively isolated from one another to determine precisely which part of the engine one hears the noise. This will help him determine if the problem is something external–like a loose engine mount or something else. But if the technician follows these basics of vehicle repair troubleshooting for transmissions and decides that the problem must be internal then he’s got to start taking things apart to find out what specifically is causing the noise. Also keep in mind that is extremely important to choose a knowledgeable technician like those at Key Transmissions and Gears. One with more experience will be more likely to know what is causing that noise (or at least have better suspicions) than a technician that is just getting started.